← Parallel Lies is up for Cover of the Month… will you click to Vote? I can only approach this from an author account basis as that is all I know about. My knowledge of BookBub is that is it a place built for readers. However it seems in recent years to have been making itself more and more author friendly, allowing authors to have a profile and list their books as well as wanting reviews and recommendations to be posted on the site. Firstly, you need to go to BookBub and claim your author profile. If you go to their home page here and scroll right to the bottom you will see a list of things to do under the Publishers & Authors title – Claim an Author Profile is one of those. 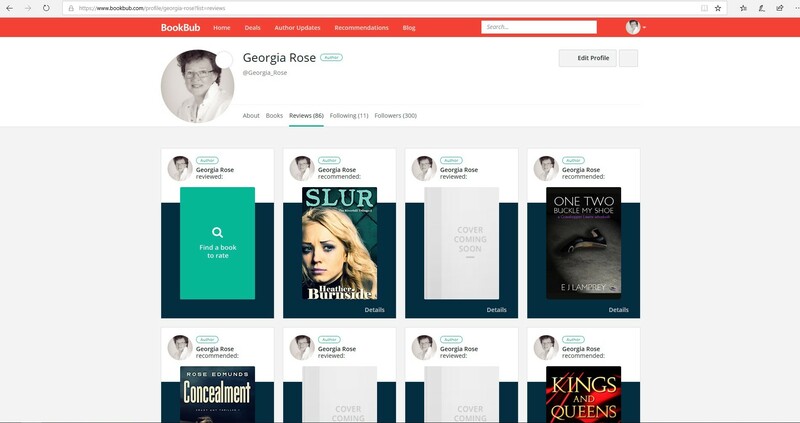 Once that is set up you will have the chance to add your books which, if they are not already, will then be added to the BookBub database. When you then login to BookBub you currently get a ‘New For You’ page full of recommendations and suggestions. Your avatar will come up in the top right corner and you click on that to reveal a drop down menu the top choice of which is View Profile. Click on that. I started adding my reviews to BookBub when Amazon.com wouldn’t allow me to post there anymore. I have since been adding all my past reviews (at a rate of three a day) and this is a work in progress. Adding a review is simple. Click on the green rectangle. A box comes up for the book title to be typed into and when you hit search a list of choices appears. If the book is there then great, click on it, fill in the details and click on the ‘Recommend’ button. You get to choose words to describe it – I do not do this. But at the bottom, in the (optional) review section, I copy and paste my review in there and click ‘Done’. If your book is not in the drop down selection then right at the bottom is the I can’t find the book I’m looking for link. You can go via that to a place where you can put in the book details and your review and again click ‘Done’. You can see in the image the blocks where the review is complete as it has a book cover showing. The grey blocks are where the book couldn’t be found in their database but, as I explained above, you can still put in the book name, the author and your review and click ‘Done’. At some later date I have found I get an email from BookBub informing me they have added the book I entered. However once you receive that your job is not yet quite done because you still need to recommend that book. You do this by clicking on the link in the email BookBub sent you. That takes you to the entry you originally made, now with it’s book cover. On the right hand side there are 3 vertical dots. Click on those and you will get the opportunity to edit your entry and all you need to do then is click on the ‘Recommendation’ box that comes up, if of course you do recommend that book. BookBub are building a positive platform here so are really wanting recommendations rather than anything on the negative spectrum. 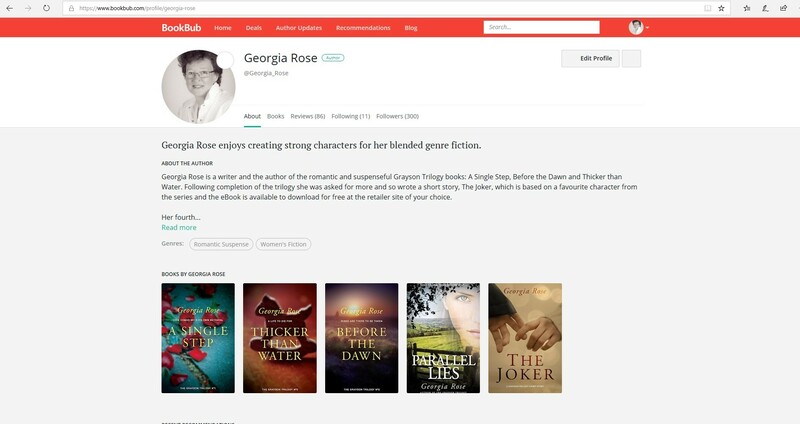 Lastly, I would make the point that it is terribly easy to get lost in the maze of BookBub, but, I have found that if I simply go back to my avatar and that drop down menu I can quickly get back to my profile again. And that is it. I think I’ve covered everything but please feel free to contact me with any questions you have on this. Also you are welcome to add any further information to this post in the comments below. Well… I’m embarrassed to confess that I’ve been in complete ignorance about this side of BookBub. While I’m signed up for their emails (which I’ve obviously not been reading thoroughly enough!) I’ve only ever thought of them as the pricey book promotion site which few people get accepted for. I didn’t realise you could set up an author profile with them! Doh! Where was I when that happened??? OK, setting up mine is now on the To Do list. Thanks for the info and run-thru, Georgia! I don’t think you’re alone, Wendy. I think they’ve been adding to the site which is why perhaps it’s sometimes a little easy to get lost in it! I am quite keen on getting that holy grail of a BookBub promotion at some point so I thought it made sense to integrate with their site as much as I could. Glad to have been of help. That’s what I need to do, Georgia – maybe add a few reviews every day. Thanks for the info! You’re welcome, Teri. I think your recommendations get sent out to your followers so it makes sense to only do a few at a time 😀 Good luck! I have been trying to find out about this for ages, so thank you for enlightening me! You’re welcome, Anita. I hope it helps but don’t hesitate to contact me if you have any problems with it.